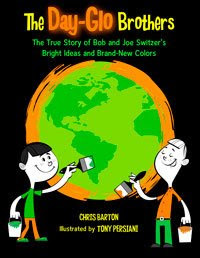 Lately, in the States, an interesting picture book has been released: it's a book telling the story of the Switzer brothers, the inventors of the so said Day-Glo colours. 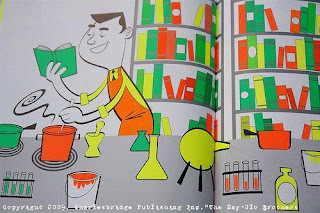 It's a non fiction book telling of how two brothers, apparently very different, thanks to curiosity, intelligence and spirit of cooperation, were able to invent something that would have revolutionized the world of colours, but not only. To understand the innovative content of this invention, just think of the many, incredible uses that are made daily of Day-Glo colours: look around on your streets and you will be amazed! 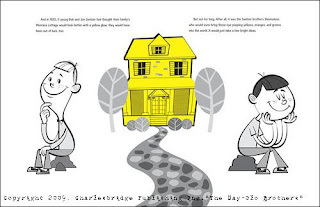 Let me add here some nice images that I hope will help better understand how much these refined New Yorker style drawings are the perfect match to a story telling how, at times, discoveries are not just casual but also the result of genius, good will and research. Colours, of course, are Day-Glo!